Efficient Corporate Governance practices cannot be conducted unless key individuals have quick and easy access to the appropriate files. With FinPro’s Meetings Management module, these key individuals have easy access to pertinent documents before, during, and after a meeting. Board meetings, committee meeting, line of business meetings can all take advantage of this module. 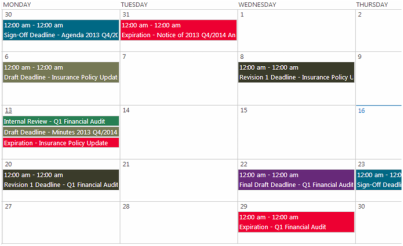 Create calendar events for various types of meetings. Develop agenda items and assign information, discussion, action, consent designations. Link files to specific agenda items. Ensure all relevant documents are being provided for each meeting. Allow participants to easily select their desired meeting and download all relevant files for that meeting.